The Principal Component Analysis (PCA) below is based on four sets of D-statistics. The second image shows what they are and how they affect the components. The datasheet is available here. If you don't know what EHG, SHG and WHG stand for, see here. Note that the post-Kurgan Europeans are shifted east, towards the Bronze Age steppe groups (most of which are in fact classified as Kurgan cultures), relative to the pre-Kurgan Europeans. Coincidence? Certainly not. Interestingly, the West Asians show a similar shift to the east, although it's not yet clear who caused it and when. Update 12/09/2015: Matt posted these graphs in the comments. The first graph shows Yamnaya-related ancestry proportions for a series of points along the Yamnaya-Middle Neolithic continuum, which can be used to estimate Yamnaya-related admixture in samples that cluster near these points. It's interesting and perhaps important that there's practically no difference between the two sets of Yamnaya samples published to date, despite the fact that they're from regions separated by ~1,000 kilometers. Yamnaya_Rise is from between the Black and Caspian seas, while Yamnaya_Haak from just north of the Caspian. Note the lack of significant Z scores (around 3 or more) in these D-stats. Although the almost significant Z score with Loschbour, a Mesolithic Western Hunter-Gatherer (WHG) from Luxembourg, does look somewhat curious. It's difficult to know what all of this means exactly without seeing any ancient samples from archaeological cultures that preceded Yamnaya on the Pontic-Caspian Steppe. However, it could mean that the Yamnaya nomads arrived north of the Caspian from the south, which is also what preliminary Y-chromosome data is hinting at (see here). Yamnaya was succeeded northeast of the Caspian by its offshoot, the Poltavka Culture, which in turn was replaced by the Sintashta Culture. 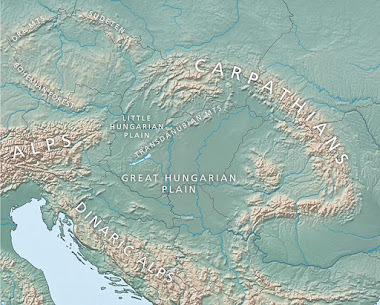 The most widely accepted theory, based on archaeological data, is that Sintashta formed from a chain of cultures derived from the late Corded Ware horizon of East-Central Europe. This is backed up by the D-stats below, which suggest some western admixture in Sintashta that is missing in Yamnaya. In this analysis I used samples from the Allentoft et al. (Rise Project), Haak et al. and Lazaridis et al. datasets, all of which are publicly available. The latter two are found at the Reich Lab site here. More than half of the 26 victims of an apparent ambush on a Linear Pottery (LBK) village in Neolithic Germany had their legs broken. The archaeologists studying the site think it was either torture or ritual mutilation. Also note the lack of young women in the death pit. They were probably kidnapped. The paper is behind a pay wall, but there's a news feature on the findings here. Abstract: Conflict and warfare are central but also disputed themes in discussions about the European Neolithic. Although a few recent population studies provide broad overviews, only a very limited number of currently known key sites provide precise insights into moments of extreme and mass violence and their impact on Neolithic societies. The massacre sites of Talheim, Germany, and Asparn/Schletz, Austria, have long been the focal points around which hypotheses concerning a final lethal crisis of the first Central European farmers of the Early Neolithic Linearbandkeramik Culture (LBK) have concentrated. With the recently examined LBK mass grave site of Schöneck-Kilianstädten, Germany, we present new conclusive and indisputable evidence for another massacre, adding new data to the discussion of LBK violence patterns. At least 26 individuals were violently killed by blunt force and arrow injuries before being deposited in a commingled mass grave. Although the absence and possible abduction of younger females has been suggested for other sites previously, a new violence-related pattern was identified here: the intentional and systematic breaking of lower limbs. The abundance of the identified perimortem fractures clearly indicates torture and/or mutilation of the victims. The new evidence presented here for unequivocal lethal violence on a large scale is put into perspective for the Early Neolithic of Central Europe and, in conjunction with previous results, indicates that massacres of entire communities were not isolated occurrences but rather were frequent features of the last phases of the LBK. I ran these tests using 65-112K transversion sites, so the results should be very solid. The spreadsheet is here. My impression is that MA1-related (ANE?) ancestry was present in South Central Asia before R1a-Z93 steppe people moved into the area during the Bronze Age. Any thoughts? All of the samples are from the recent Allentoft et al. and Haak et al. papers, available on request from the authors and here, respectively. Based on all analyses, we can tentatively model Kets as a two-way mixture of East Asians and ANE. Therefore, ANE ancestry in Kets can be estimated using various f4-ratios from 27% to 62% (depending on the dataset and reference populations), vs. 2% in Nganasans, 30 ‒ 39% in Karitiana, and 23 ‒ 28% in Mayans (Suppl. file S7, see details in Suppl. Information Section 8). Integrating data by different methods, we conservatively estimate that Kets have the highest degree of ANE ancestry among all investigated modern Eurasian populations west of Chukotka and Kamchatka. We speculate that ANE ancestry in Kets was acquired in the Altai region, where the Bronze Age Okunevo culture was located, with a surprisingly close genetic proximity to Mal'ta. Later, Yeniseian-speaking people occupied this region until the 16th-18th centuries. We suggest that Mal'ta ancestry was later introduced into Uralic-speaking Selkups, starting to mix with Kets extensively in the 17-18th centuries. I'd say these findings make a lot of sense. Below is a spatial map put together by Sergey, based on my K8 model, showing the distribution of ANE across much of Eurasia. Note the ANE peak of around 28% among the Kets. Of course, Mongolians never made it to Finland or even Northern Russia (Kargopol area) where these Russian samples are from. How did this crap get through peer review? 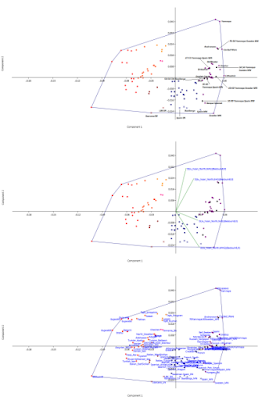 The proportions of admixture from ancestral EUR and EAS [European and East Eurasian, respectively] were estimated, and are shown in Table 2. CEU populations mostly originating from France and Germany had a small fraction (0.7 +/- 0.8%) of genetic material from EAS. People from Great Britain such as British (GBR) and Orcadian inherited 2.5%–3.8% from ancestral EAS. Finnish (FIN) and Russians inherited significantly more genetic material (>12%) from ancestral EAS, which is consistent with their historical record of admixture with Mongolian populations. Besides, Adygei from Caucasus inherited 3.2 +/- 1.0% from ancestral EAS. When, and how exactly, did ANI become ANE? I didn't get the memo. The geographical distribution of the dark green component (ASI or Ancestral South Indian- unique to the subcontinent) was largely limited to the Indian subcontinent, and can be seen among all the populations of the subcontinent albeit in variable amount, whereas the second major component (light green: ANI or Ancestral North Indian (now ANE- Ancestral North Eurasian )) was shared with Central Asia, the Caucasus, Middle East and Europe (Fig 1c). The geographical origin of light green component (ANI or ANE) is so far unclear and more research is needed from unsampled area as well as from ancient DNA; however, the time of spread of this component from its origin place (either of any; the Caucasus, Near East, Indus Valley, or Central Asia) has happened more than 12.5 thousand years before , which is significantly earlier than the purported expansion of Dravidians and Aryans languages from outside the subcontinent. Notably, the Andaman Islanders are not the only population carrying the ASI component exclusively, as was suggested before . Austroasiatic speakers (more precisely, the South Munda) of the subcontinent also seem to possess the ASI component in near unadulterated form (Fig 1c). More research with complete genome analysis would be required to clear the geographic center of the ANE component; however, it is evident from the present analysis that the dark green component (ASI) can be considered as a connecting thread for all the Indian populations (Fig 1c). Taken together, these results support the second hypothesis suggesting that all Indians, irrespective of their caste or tribal affiliations, share a common genetic ancestry, which is undoubtedly founded over the indigenous ASI component. The Estonian Biocentre has uploaded a new dataset from a forthcoming paper on the population structure of Slavs. It includes Latvians, Slovakians and Slovenians. Below is a Principal Component Analysis (PCA) featuring these individuals. Most of the other samples are from the Human Origins dataset. Obviously, Latvians aren't Slavs; they're Balts just like Lithuanians. They're probably in this dataset because Balts are close neighbors and relatives of Slavs. Note that these six Latvians are overall the most northerly group in this analysis, which suggests that they have the highest ratio of European Hunter-Gatherer ancestry. Nevertheless, they're obviously still very similar to Lithuanians and their Uralic neighbors to the north, the Estonians.